Maikel Franco celebrates after hitting a three-run homer in the first inning off Rockies pitcher Tyler Anderson. 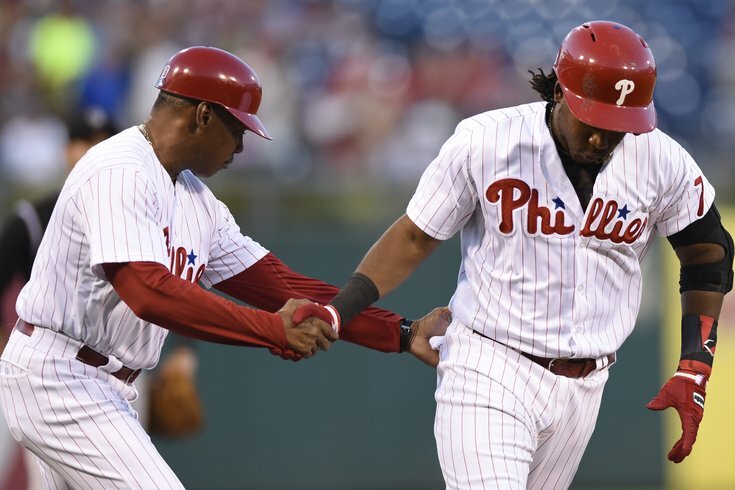 Anderson would hit Franco with a pitch in their next meeting, leading to both benches and both bullpens clearing at Citizens Bank Park in the fourth inning. For the second straight night, a monster home run that appeared to be headed for Ashburn Alley swung the balance in a meeting between the Philadelphia Phillies and Colorado Rockies in South Philly. But unlike Ryan Howard’s decisive grand slam blast a night earlier, to snap a tie in the middle of the game, Maikel Franco’s three-run shot came in the game’s first inning. And it may or may not have resulted in the tempers between the two teams flaring up to match the announced heat index of 105 at first pitch. On the very first pitch of Franco’s next at-bat, to lead off the fourth inning, Rockies left-hander Tyler Anderson uncorked a 92-MPH pitch that caught Franco on the lower half of his left leg. Franco glared at Anderson. Someone else – perhaps Carlos Ruiz, who was on deck? – said something to the Rockies pitcher, who appeared to shout an obscenity back. And then home plate umpire Eric Cooper pointed toward Anderson, who immediately went into defense mode. Maybe he was telling Cooper his words were directed at the other player, and not Franco, since the latter would seem to incriminate him for an intentionally hitting a batter? Well, no one else in uniform was taking their sweet time deciphering the goings on between the mound and the plate. They were making their way there, as both benches and bullpens cleared at Citizens Bank Park. But, alas, a meeting between the Rockies and the city that made Rocky famous did not involve any punches, or even pushes. There was a whole lot of talking, though, and when that was all through, both Anderson and Colorado manager Walt Weiss were informed by Cooper that their services were no longer needed on Saturday night. Following the ejections of their starting pitcher and manager, the Rockies rallied back. But the Phillies still held on for a 6-3 victory. "I don’t know if he threw it on purpose or not," said Franco, who added that Anderson apologized immediately after the pitch. (Note to Nick Piccone, our man on pro wrestling at PhillyVoice: I'm not so sure it was on purpose, but I agree on the umpire part). "It kind of looked (intentional)," manager Pete Mackanin said, "and I'm not going to argue with the umpire." Weiss did and was ejected. But why was Anderson given the hook before a warning? "You have three options," umpire crew chief Gary Cederstrom said after the game. "Choose to do nothing and play on, issue a warning, or eject. And Eric chose ejection." The Phillies (55-63) have won three straight games for the first time since reeling off a four-game winning streak between July 3-6. They’ll send Adam Morgan (taking the place of Zack Eflin, possibly out for the remainder of 2016) to the mound on Sunday afternoon in an attempt to collect their first three-game sweep since taking one over the Atlanta Braves in that aforementioned winning streak the first week of July. Although the Rockies rallied again in the ninth – sending 30-home run man Nolan Arenado and raking rookie David Dahl to the plate with runners in scoring position – Jeanmar Gomez persevered and upheld the three-run lead he had when he entered. The save was Gomez's 30th of the season. The three runs Franco posted onto the scoreboard in the game's first inning were the difference. "It was a beautiful thing, a beautiful thing for me and for my teammates," Franco said. "Three runs in the first inning. (Jerad) Eickoff did a pretty good job today. You just have to put something on the table for your team and just do everything possible you can." Even if it means taking one off the left knee, too. But then he turned a 4-0 lead into a 4-3 game with the game-tying run on third when he served up two home runs and a triple, the latter to Colorado pitcher Chris Rusin. Eickhoff (5 2/3 IP, 10 H, 3 ER, 2 BB, 3 K, 2 HR) was promptly removed from the game after the triple. • Carlos Ruiz, like fellow veteran and 2008 WS alum Ryan Howard, has appeared to benefit from his role as a part-time player. Ruiz went 1-for-2 with a double and two walks in Saturday's win. By reaching base in three of his four plate appearances on Saturday, Ruiz raised his on-base percentage to a gaudy .381, which ranks second among big league catchers with a minimum of 150 plate appearances (behind Washington's Wilson Ramos, .384) and 27th among all major league players (again, min. 150 PAs). • Prior to the game, a Who's Who of Phillies alum (including Andy Ashby!) were introduced on the field on the second day of Alumni Weekend at Citizens Bank Park. Jim Thome, the newest Wall of Famer among them got to hang out with the Phanatic later in the night, and, of course, enjoyed it as much as any kid had they had the chance. The Phillie Phanatic let Jim Thome operate his hot dog gun. Thome appeared to enjoy it like he'd just won a playoff game. Again, who doesn't love Jim Thome?